I’ve said this a few times, but basically no pitcher is good enough to put up the kinds of results Jake Arietta’s been putting up, with the possible exception of Clayton Kershaw. You get to these results by being both good and lucky. And yesterday’s game was a perfect example of that. Was Arietta good? Yes. He struck out 11 in six innings and gave up no runs. Was he lucky? Absolutely. He allowed multiple base runners twice, including loading the bases with one out, and got out of it both times. His strand rate last year was 80%, and this year it’s even higher, and the splits don’t seem to indicate that he gets appreciably better at striking people out with runners on, either. Maybe Arietta has discovered some new way to pitch from the stretch that renders him immune to typical strand rate regression, but that seems unlikely. And it sounds goofy to say any of this, because it sounds like I’m saying he’s good because he’s lucky, when I’m really saying he’s both. On the other side, Liriano gave up two runs on two pitches (which is, in case you were wondering, the maximum number of runs you can allow on that many pitches)…and then settled down for several innings. He left with some runners on in the 6th, so his line ended up looking pretty bad, but considering the opponent and the first two pitches he threw, it had the makings of something a lot worse. At this point I’m convinced Liriano is unlikely to round into shape enough to get his overall numbers roughly in line with the last few years, but I’m also unconvinced he can’t be a productive starter in the second half. Others have made a convincing case that what looks like several different problems may actually be one with multiple ripple effects, and I just can’t believe (not yet, at least) that he’s suddenly twice as susceptible to the long ball. The Bucs managed just three hits yesterday. Since his three double game against Colorado, Gregory Polanco has just one extra base hit (a double) in eight games. The Pirates are below .500 for just the second time this season, and the first time in two months. They’ve lost eight of nine and they haven’t beaten the Cubs in any game where Gerrit Cole wasn’t wearing a cape. I’ve been saying for awhile that whether Jameson Taillon was particularly good or not, whoever he ended up taking starts from probably wouldn’t have been any better. Taillon’s major league debut was a fine example of that: he threw the minimum required for a Quality Start: six innings, three earned runs. He only struck out three, and he walked two, allowing six hits (one a home run). It was perfectly average, but given how common it is to struggle when adjusting to the highest level, that’s a pretty encouraging beginning. Also encouraging is that the Pirates fared reasonably well against Syndergaard, scoring three runs (two earned) in six innings, and feeling like they could’ve gotten more: they banged out seven hits and drew two walks against him in those innings, and only struck out five times. But the Bucs blew leads of 2-0, 3-2, and 5-3 (in the 8th inning, no less). In all, four relievers threw four innings, allowing three runs, and that’s why they lost in 10 innings. Yesterday’s doubleheader came back to bite them, with Feliz presumably unavailable in the aforementioned 8th (or only available in desperate circumstances) after throwing an inning in each of yesterday’s games. The only reliever not to allow a run, Watson, struck out the side. Offensively, it was a good game: of the 10 Pirate hits, six of them were doubles, and three of those were from Gregory Polanco. Polanco leads the league in doubles, and at this point I think the thing most likely to stop him from continuing to do so is the possibility that they start landing on the other side of the fence more often. One of last night’s doubles came shortly after a towering fly ball down the right field line that was just foul, but if fair (and if it hadn’t hit a sign) would’ve end up waterlogged. Yesterday’s twin wins eases the frustration with this loss, but otherwise it’s a pretty bad one: three different leads blown, and its pretty easy to chalk this up as a loss that wouldn’t have happened if the Bucs were playing a relatively normal schedule. But they aren’t, so here we are. Still, a very good series win against a good Mets team. The Bucs played well enough to win all three, and get credit for two. This is the kind of skill they’ll need to show throughout June to come out of the other side still vying for a playoff spot, and it’s the kind of skill they hadn’t shown much in the handful of games beforehand. It’s a good start. Welcome to the bullpen, Juan Nicasio. Jeff Locke threw a shutout last night. And not only was it the first shutout of his career, it was the first complete game, too. He struck out only one, but allowed just three hits and walked none. Needless to say, the Game Score of 82 was a personal best. He was only a few pitches shy of a Maddux. I was pretty surprised when I glanced at Jeff Locke’s stats while writing this and saw that he has a 5.08 ERA. Obviously, he was getting shelled early on, but over the last month he’s been much better. One thing I’ve learned writing these previews, though, is that “good” starts do a lot less to improve a starter’s overall numbers than really good ones. It’s those seven scoreless innings that really drag that number down: 6 innings and three runs looks great in isolation, but it’s a 4.50 ERA. Case in point: last night’s game dragged his ERA down to 4.33. The Pirate offense gave Locke more than enough to work with, scoring 10 runs on 14 hits. As those two numbers probably suggest, they got their share of extra base knocks: five in total, including home runs from Gregory Polanco and Sean Rodriguez. Let’s talk about both for a moment: if you told me Gregory Polanco was going to hit his first career grand slam, and that I somehow wasn’t going to use an image of his swing’s follow-through for the recap to this game, I probably would’ve sarcastically replied “what, is Locke going to throw a shutout or something?” So I’m as surprised as you are to have anyone else at the start of this post. As for Rodriguez: what on earth is going on? Rodriguez is slugging .597. He has six home runs in 77 ABs. I know we’re playing with house money here, but I thought that three homers ago. His BABIP’s a little high, and his K rate is up…but his walk rate is at a career high. Last year, it was at a career low, which means it’s over six times as high this season as it was last season. Obviously, you can only run from the regression monster for so long, but it’s reasonable to entertain the idea that, even if he’s much worse going forward, he might not be a massive offensive liability. One can hope. One other hitter that needs to be singled out is Freese, who went 4 for 5 last night. The big picture story this year has been the offense, but zooming in on it, the story within that story is that the Pirates are rotating two or three bench guys into the lineup on a regular basis, and seemingly paying no production penalty whatsoever for doing it. We talked a little last year about the Pirates’ conditioning research, and I’m hoping to write a bit more about this, but this might be an example of it paying dividends. The thing you hear most about this lineup from its fans is that it “just keeps coming.” It’s relentless. There are some exceptional hitters here, to be sure, but the Pirates have had exceptional hitters before: Brian Giles, Jason Bay, and Andrew McCutchen. They still didn’t win, because they surrounded those guys with mediocre players, and most games were trotting out one or more offensive black holes. What’s different about this lineup is that it’s deep, both top to bottom (Jorder Mercer hits eight and is OPSing over .750), and back to front (it hasn’t been a huge downgrade when Freese or Rodriguez spell a starter). Case in point: Jung Ho Kang and Josh Harrison took a seat last night, and both of their replacements—Freese and Rodriguez—hit home runs. Rodriguez’s was a solo shot, and Freese’s was a two-run bomb to center. That’s what made this win a little more interesting than most: it didn’t come from wearing the starter down and getting into the bullpen, or by steadily accumulating runs throughout the game. The Pirates scored all of their runs in two consecutive innings, and four of them in fifth. Preceding Freese’s homer was another Polanco double (it seems like he’s basically allocated a double per game), which was preceded by a scorching McCutchen single. All of the starter, De La Rosa, who handled the Pirates so effectively the last time they met. Jeff Locke was shaky, giving up four runs in 6.1 innings, but this is exactly the kind of start you’re usually expecting from someone in his position. If he can work through six, and even a little past it, while keeping the game close, that’ll be plenty most nights. That extra inning means the Pirates can bridge the gap to the end of the game without cycling in some of their less reliable relievers, though Tony Watson was on paternity leave tonight, so Hughes had to get a couple of outs (which he did without incident). I wouldn’t call this is a “good” start for Locke, but it was an acceptable one, and he’s been acceptable or better every time but once since that blowup in San Diego. This is the third straight series the Pirates have won, and they’ll be heavy favorites to sweep this afternoon with Cole on the mound. I have a weird relationship with the movie Bruce Almighty. Bear with me, because I promise I’m actually going somewhere with this. When I was younger I started a movie website. It had news, reviews…all the stuff you’d expect a movie website to have. It’s still running to this day. One day I posted a casting update for Bruce Almighty; Morgan Freeman had been cast as God. Seemed like a good/fun choice. A year or two later, the film came out, and it was surreal. Not the movie itself, but seeing on the screen something that I remembered posting news about so early in the process. It was the first film I can remember following from the start, and then seeing made into reality. This never seemed to happen with Pirates. I remember reading about Chad Hermansen, Ron Wright (that epic minor league power hitter we got in the Denny Neagle deal), J.J. Davis, and John Van Benschoten. I remember thinking “wow, when these guys all come up, we’ll be good again!” And somehow it never happened. It was like watching epic trailers for movies that never got released. That changed with Andrew McCutchen. Andrew McCutchen is the first star I saw form. The first whose entire career arc was visible across the sky. The day he was drafted, the interviews, the scouts talking dreamily about him. All the stuff I’d heard before and learned to distrust. But then the minor league reports came rolling in. He was performing at all levels, rising steadily, sometimes performing better the next level up than he did before. He was charting a trajectory so steep it had no choice but to break the orbit of the bigs. And then he’s there, in a Pirates uniform, and he’s good right away. But even that doesn’t break through the pessimistic defenses I’ve constructed. It takes until 2012, when he leaves the galaxy entirely and becomes one of the best players in baseball, and the flinch is gone completely in 2013 when the league formally recognizes him as such. This has happened again since, though it’s still rare. I remember Gerrit Cole being drafted. I remember him rising through the minors. I was there for his first start, and I’ve seen him flip that switch and become one of the best in the world at the game he plays. And now it’s happening again. I’ve written almost 400 words and I’ve yet to mention the name of the player this post is actually about: Gregory Polanco. I don’t actually remember the day we signed Polanco, because he wasn’t drafted. He was signed as an international free agent from the Dominican Republic in 2009 for $75,000. For the first couple of years, he was all potential: he hit .202 in the Gulf League in 2010, and it wasn’t until 2012 that he started getting people’s attention, hitting .325 in single-A West Virginia. Before that, he was exactly the kind of prospect Moneyball warned you about: all projection. All scouts’ dreams about how he might grow into his body, or how good he’d be if all his skills reached their ceilings. But that’s exactly what started to happen. By 2013, Baseball America had named him the 12th best prospect in baseball. He kept forcing the Pirates’ hand: in 2013 he played in A+, AA, and AAA, and just wouldn’t stop hitting. He was hitting .347 in AAA when they called him up nearly two years ago. Unlike McCutchen, Polanco wasn’t good with the bat right away: he was able to stay on the field thanks to his defense and base running, and played an underwhelming 89 games in 2014. Nobody was worried, because nearly every star player has a forgettable half-season at the start of their career. Many predicted a breakout in 2015. But that didn’t happen: he had a .653 OPS in the first half, and there were rumblings of a benching, or a demotion to work things out. There was talk of trading for outfield depth. By the end of the season, everyone had made the same quip: Polanco had improved so much in the second half that their best trade deadline move was not trading for anyone to replace him. He OPS’d .749 after the break, and had a penchant for putting together long, memorable at bats against some of the best pitchers in the league. This season, it’s hit another level. In less than a year, he’s gone from borderline startable to hitting third. The results are tremendous: I could list all the things he’s doing better (line drive percentage, fly ball to ground ball ratio), but it’d be a waste of time, because all you need to know is that all of them are better. And it’s not just the results: he looks good. He’s hitting balls hard. As the picture way back at the top of this post shows, sometimes he’s basically swinging out of his shoes. He’s in the top ten in National League WAR, tied with Bryce Harper. He’s 24 years old, and if he finished as a better player than Andrew McCutchen this year, I honestly won’t be surprised. Brighter stars than Gregory Polanco’s have burned out. Players get hurt, pitchers adjust. Stuff happens. But I’ve seen a couple of stars form over the last decade, and this feels the same. It may be that Polanco ends up a phenom who has a short peak in the majors. I don’t know what his floor is, but I’m not convinced his career has a ceiling. It’s a career that can leave the solar system, and float off into the heavens, where there’s another Pirate right fielder who seized all of his potential. I said before this series started that the goal was three of four, and most in fairly definitive fashion, and I think we achieved that. One close loss, one blowout, one blowout that turned kinda close, and a solid four-run victory mixed in. +10 run differential. That’s what you’re supposed to do. It was particularly nice that the pitching got its act together these last two games. 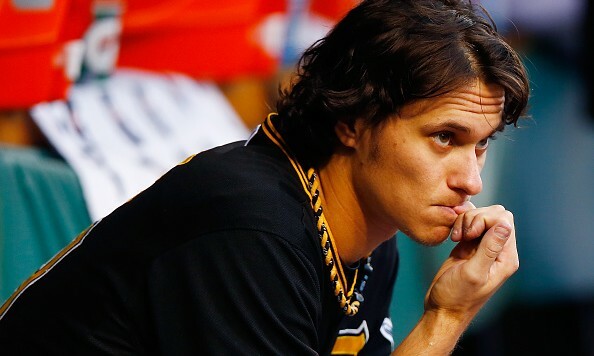 Two nights ago it was Liriano, unsurprisingly, who stopped the madness, but last night it was Jeff Locke, who gave up two runs in seven innings. Let’s talk about Locke for a second. His peripherals still aren’t good (the last two years his xFIP has been under .400, indicating he’s actually been pretty useful, but this year it’s closer to 5.00), but he’s looked much better as of late. Take out the Cubs start (I know, I know) and he’s got a 2.77 ERA over his last four outings. He’s walked exactly two batters in each of them. His K rate isn’t great, but it’s weirdly erratic: six last night, six against Cincinnati, eight against Colorado, but just one against St. Louis. The joke with Locke is that he’s terrible until it’s about to cost him his job, and then he figures it all out, like a guy who crams for an exam at the last minute (an analogy that works in large part because he looks so very much like a stoned college student). This might really be his last semester, though: Pirates’ fans are hashing out whether or not Jameson Taillon should replace him or Nicasio in the rotation (the argument being not that Locke’s been a better starter, but simply that Nicasio has more value in the bullpen). But that’s just what happens in a few weeks: one would think even marginal control improvements from Tyler Glasnow would land him a spot shortly afterwards, in which case, well…he’s probably not beating out Jonathan Niese, for all his struggles. This really might be it, and in true Jeff Locke fashion, he might end up looking pretty good leading up to his exit. The offense was tremendous again. Gregory Polanco homered and tripled and I’m honestly asking myself if I expect him to be more valuable than McCutchen next season. I don’t think it’s a ridiculous question any more. The Cubs lost again. That’s three of four and five of their last ten. It’s always nice when the Pirates do so many good things that I have trouble deciding which photo to use on the recap. In this case, I strongly considered a shot of John Jaso, his dreadlocks hanging in midway, post-swing. But the imminent (already begun?) breakout of Gregory Polanco is the single best development of the young Pirate season, and the single biggest play of the game was his three-run homer, so it had to be him. And it’s going to be him any time it’s close, I expect, such is my level of excitement. That was Polanco’s only hit, though, and Jaso had three of them (including a homer of his own). The Bucs as a whole banged out 14 hits, hitting up Wacha for four in six innings, and then unloading on his replacement, Matt Bowman, who faced four batters and didn’t retire any of them. The only thing I’m remotely concerned about from this game is that Gerrit Cole continues to look good rather than great. Here, he gives up two runs in six innings. The seven Ks are nice, and I’m certainly not worried, but he’s rarely looked dominant this year. Kyle Lobstein made the game uncomfortably interesting, giving up three runs in less than an inning, and Caminero continues to look…not quite right. But Feliz came in for a K, then was replaced by Watson, who through a clean inning. The bullpen is still a concern, but I think we’re largely past the experimental phase. If Watson settles down and we stop using Caminero in high leverage situations for the time being, it could be decent again. This series was a nice bounce back for the Bucs: after getting swept by the Cubs, they come back and win two of three in St. Louis, with the only loss being a game they still very nearly won. They continue to look like a 90-ish win team, and that’s with a couple more players on the way and a couple others (presumably) returning to form at some point. Of course, that’s also getting particularly good results from a lot of question mark players, but most signs point towards this being another genuine contender, albeit one headed for another coin flip game. A quick note on the likelihood of another Wild Card game: after the Cubs swept the Pirates, they swept the Nationals. In a four game set. The Nationals were the second-best team in the NL before this series. In other words, it’s entirely possible that Chicago has an historically good ball club this year, and that all the hand-wringing about us maybe winning 88 games instead of 98 won’t matter. It was absurd to expect the Pirates to win 101 games last year just because they happened to be stuck in the same division as the best team in baseball (and in a year where the best team in baseball was particularly good), but it was understandable, because we lost a number of close games to them. But if the Cubs rampage to 106 wins, and do it through ability rather than cluster luck or something, there’s really nothing to be done. Instead, I have to use Chris Stewart letting the ball come loose at home, not because that was the most egregious mistake (though it was pretty bad), but as a dramatic representation of the half-dozen defensive miscues that gave this game away. Pitching, hitting, defense. Pick two per game. And that’s kind of how it’s been: excelling in one or two facets of the game, per game. Reality, wry minx that she is, underlined the defensive problems and their role in the loss in thick red marker by having the Pirates slightly misjudge two doubles that went just over the outfielders’ heads, then head the Pirates hit two of their own in the 9th, only to have the Reds’ left and right fielders just make the catch reaching over their heads. If they miss either, the Bucs probably win. If the Pirates catch either of theirs, the Bucs probably win. Of course, the bright side is that things had to line up just right for the Reds to avoid being swept, and they still nearly lost. And the individual performances here were very encouraging: Polanco hit a bomb into the river to give the Bucs a 1-0 lead, and looks more intimidating by the game. His walk rate has almost doubled from last year, his K rate’s down 50%, and his isolated power is higher than at any point in his minor league career. This might be it, ladies and gentlemen. Less encouraging long term (but nearly as valuable in the here and now) is that Jeff Locke was good. Really good. Again! That’s two very strong starts in a row for Locke, and again, he really only needs to be good occasionally to justify his existence at the end of the rotation. Obviously, another sweep would’ve been nice. Obviously, seven wins in a row headed into the huh-ooge Cubs series would’ve been great. But the things that went right in this game are things that weren’t givens: Polanco continuing to break out, Locke being disconcertingly competent, the offense continuing to roll. The things that went wrong (defensive lapses) probably aren’t going to be a major long-term problem. Bad defensive play is infuriating precisely because it doesn’t usually happen this often, but the flip side of that is that it’s not necessarily indicative of a problem that needs fixing. The Bucs are 15-10. This is a very good start to the season. The things that are working may plausibly keep working, and the things that aren’t appear at least moderately fixable. There’s work to be done, but this year, they can start doing it with a little margin. Over the last couple of weeks we’ve had a few games that could serve, if necessary, as microcosms of this early season: Bucs jump out to a lead by knocking the starter around, our own starter gives up a couple here or there, the bullpen hands several back, and we never add on much to the early lead. Next thing you know it’s the 7th inning and we’re suddenly playing a baseball game again. This example was worse than most, as the Pirates led 7-0 after 3.5 innings. But, ya’ know, Coors Field. The Rockies put up four to make it a game, then just kept chipping away. It finally ended when Polanco walked and Mercer doubled him home in the 12th. Tony Watson gave up another home run. Feliz gave up two runs. Melancon threw a scoreless inning (but walked two). In other words, everything that’s gone well this year continued to go well, and everything that’s gone badly continued to go badly. I’m tempted to withhold any judgment of Niese, who started off strong but ended up giving up five runs in as many innings. Colorado isn’t the best place to fix your pitching problems. But it’s getting to the point where the Bucs have to start realizing what they have with some of these guys, and make adjustments as necessary. A few more series’, I think, and it’ll be time to make some of these choices. In the meantime, it’s nice that the offense is good enough to bail us out while the bullpen sieve keeps panning for black-and-gold. The Pirates have won this four-game set, with a chance to sweep today. They’ve won four in a row for the first time since the first four games of the season, they’ve won 6 of 7, and they’re 13-9. They’ve scored at least six runs in all those six wins, and they’ve scored at least eight in five of them. So far this season, the offense has been tremendous and the rotation has been shaky (though more at the top than the bottom, at least relative to expectations), but the difference between our decent 9-8 start and a much stronger 11-6 is the under performance of the bullpen. Last night, the relievers again failed to bring relief, but the offense was so good it didn’t matter. Jon Niese gave up ten hits and four runs, letting Arizona back into a game the Pirates led 5-1 in the third inning. But there was little doubt that the offense was going to score more runs: it was just a question of how many the bullpen would give back. It turns out, it gave back all but one, which is the minimum number you can give back without blowing it. This time, it wasn’t some fringe reliever from the Throw Stuff Against the Wall routine we do each April, but Tony Watson. Watson gave up three runs (though just one earned), including a homer. That’s his second long ball given up in his last three appearances. His walk rate’s up, his K rate’s down, and this is all despite an abnormally low .182 BABIP against. I’m not particularly concerned right now, because relievers’ numbers can be ridiculously skewed based on a couple of bad outings even late in the year. But it’s easy to take for granted just how effortless and automatic Watson has been the last few seasons. That wasn’t, you know, normal. The Bucs were actually outhit in this game, 15-13, and they drew just two walks. But that’s because everything was hittable. Seven of their 15 hits went for extra bases, including three monster home runs. Sean Rodriguez hit his second tape measure shot in his last six ABs, Gregory Polanco similarly murdered the ball on the very next pitch, and Jordy Mercer (!) somehow bested them both the next inning, with a home run that we were told was the longest hit by any player this year. Jordy Mercer. Josh Harrison went 3-for-4 with two doubles, and looked very much like the Josh Harrison of 2014, legs churning around first, helmet flying off, and all the other expressions of manic energy that characterized his improbable All Star selection. His OPS has risen from .541 to .779 in the last eight games, six of which have been multi-hit games, including five of the last six. This is good. This is very good. If the pitching gets even marginally better, this could be an extremely good baseball club. And it’s nice to see, over the last handful of games, that it could be a pretty good one even if it doesn’t.